There are at least three ways to dine at Akira Steak House & Sushi Bar. The first and noisiest, of course, takes in the clanging spatulas at the reverberating hibachi tables, where pyrotechnics and sound effects reign. The second is at the sushi bar, which provides a more serene production, unless the birthday parties behind you are getting out of hand. 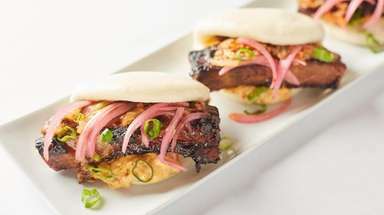 The third: any seat for fusion fare that's removed from the perpetual-motion shows. So, what's probably the quietest part of the dining areas is an alley-like sliver that's decorated with a hands-and-forearms image edited from Michelangelo's "The Creation of Adam." Suitably inspired, you'll be in for elegantly presented specials such as the lustrous sashimi of live scallop and the carefully sliced sashimi of giant clam. The flavors are pure; the quality, high. Traditional sushi also is flavorful at Akira, especially mackerel, fluke, sea urchin and yellowtail. The sushi chefs are a busy crew, spending a fair amount of their labor creating kaleidoscopic sushi rolls, which invariably trail the pristine seafood. 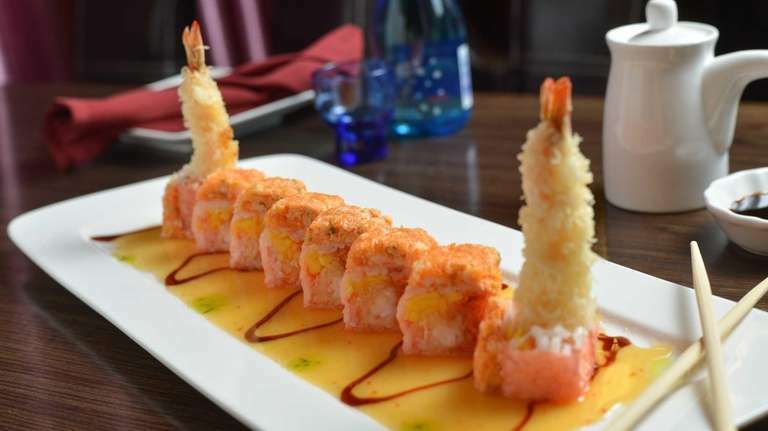 The "angry dragon" is a colorful combo of spicy tuna, tempura shrimp and mango inside; spicy blue crab meat wrapped with soybean seaweed, outside. It doesn't need sweet citrus sauce. The "pink lady" brings together lobster salad, shrimp, crabmeat, salmon, tuna, mango and cucumber for a very crowded inside; rice paper is the wrap. Also not required: the "spicy sweet sauce,'' which is neither. 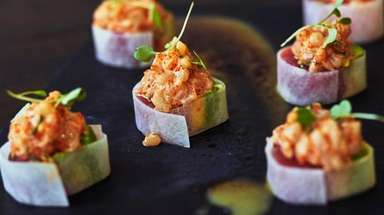 Tasty sushi-bar appetizers include "dinosaur eggs," or a trio of spicy tuna; lobster, shrimp and crab; and spicy salmon, wrapped with a sliced avocado that makes them look like mini-sfogliatelle created for St. Patrick's Day. Although purists may consider ritual suicide before ordering it, the flavor is good. Same for the spicy tuna-and-spicy salmon wontons, served atop guacamole. There are a few disappointments among the cooked appetizers. Grilled sake-miso-slathered black cod arrives overdone and oversauced. Chicken lettuce wraps with curry sauce are dry. Malaysian curry chicken is dull. 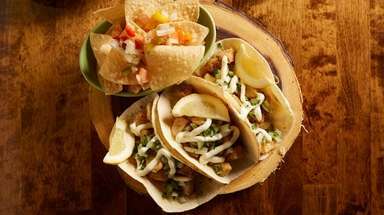 And avoid bacon shrimp, which wraps the bacon around the shellfish and asparagus before submitting to the final indignity of spicy mayo. You're better off with gyoza, or fried pork dumplings; and the combination opener of crisp shrimp and vegetable tempura. Seaweed salad with sesame seeds: excellent. 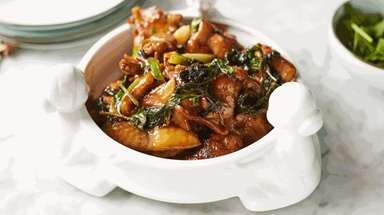 The vegetarian hot-and-sour soup stays clear of the usual medicinal aftertaste. You'll need a fourth way to dine for dessert.